It’s a tough world out there, and this is especially true for those that manufacture and sell watches. After all, if you own a cellphone, the timepiece strapped around your wrist is not particularly necessary. You wear it because you like the style. 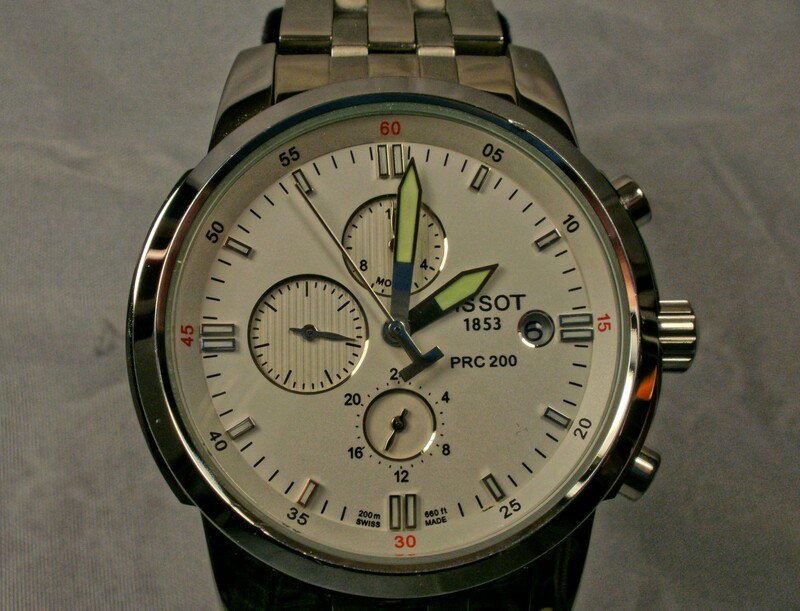 Competition is cutthroat in every price category and, for a watch company to survive, name recognition is the key. Many of the smaller and more obscure brands work with the watch subscription service, Watch Gang. 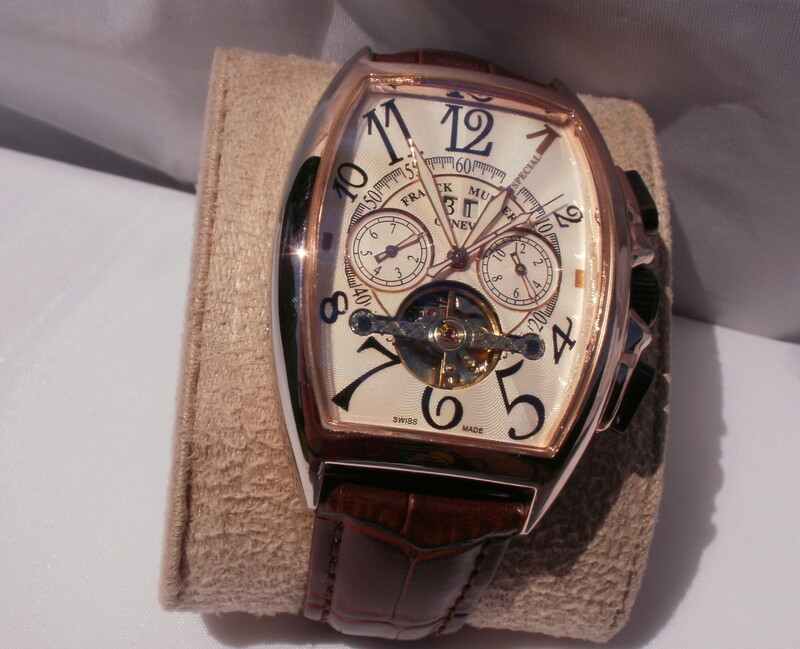 Profit is minimal because their timepieces are sold at a price far below retail. If, however, their product is appealing, the result will be a healthy uptick in sales. Today’s test subject is J. Brackett’s Camden watch. My expectations are high because I already own, and really like, one of their automatics. The Camden weighs in at 53 grams (1.9 ounces). Its diameter reaches 42 millimeters, and it is 10 millimeters thick. 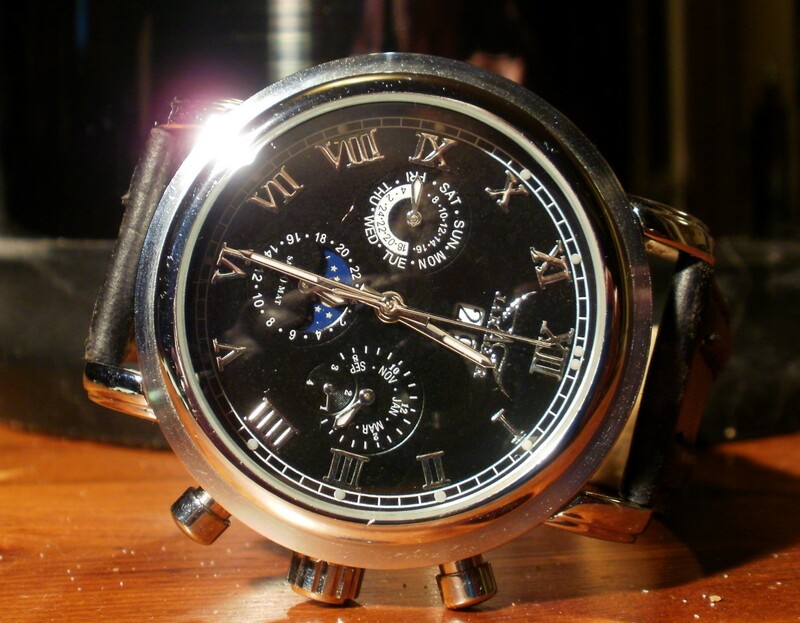 A black dial is marked with indications for hours and minutes. Large white Arabic numbers denote the even hours, and a small round window displays the date. The timepiece’s hands are coated with luminous paint. 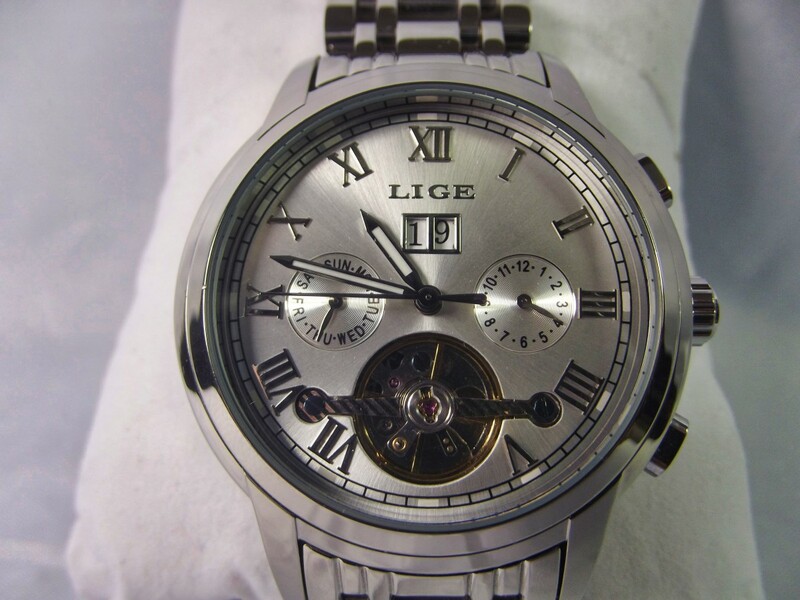 The case is composed of shiny 316L stainless steel and, from all appearances, is equipped with antique style wire lugs. 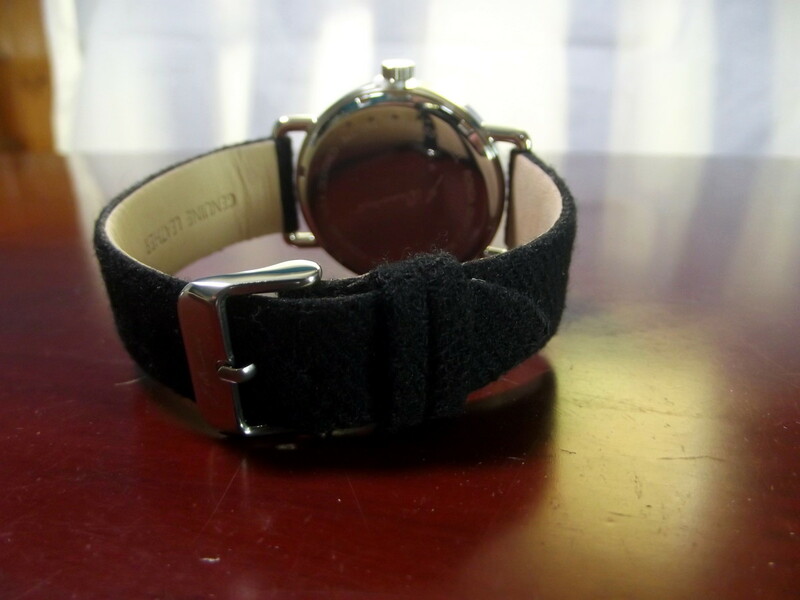 In actual fact, clever design work allows attachment of a modern 20-millimeter strap. 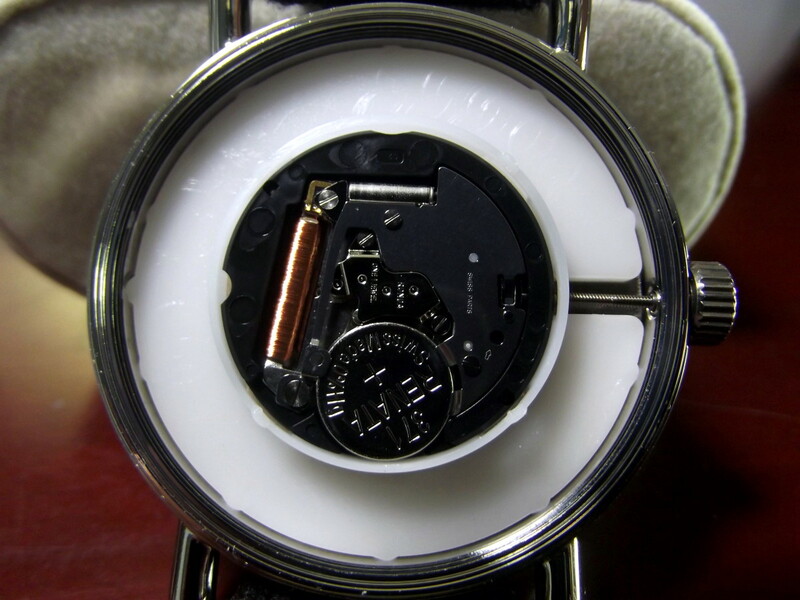 A Ronda 505 quartz movement powers this timepiece. It is labeled Swiss parts, suggesting the movement was assembled at Ronda’s factory in Thailand. This watch has been rated 5ATM and is suitable for shallow swimming. The Camden is matched to a pressed wool strap backed with leather. 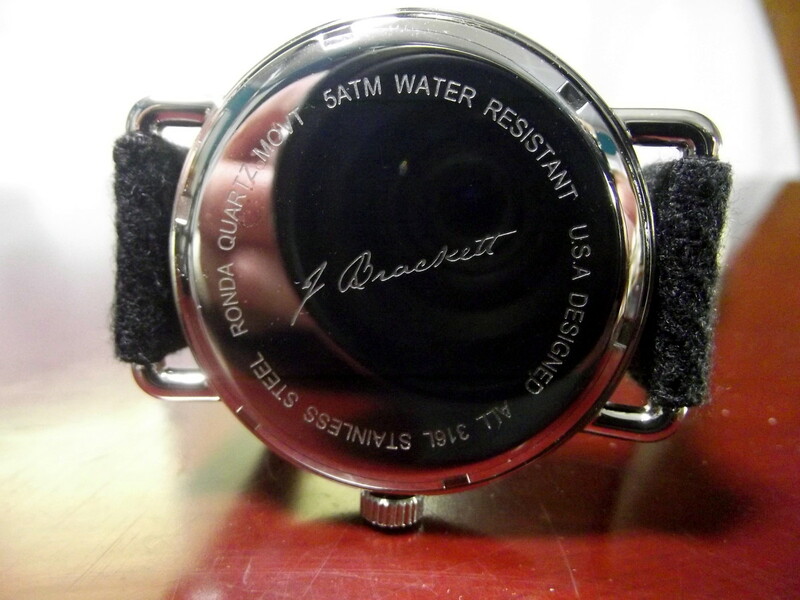 J. Brackett is a small company that sells variations of two watch models. The Camden is equipped with a Ronda quartz movement, and the Navigli is powered by a Seiko automatic NH35. Little is known about this company. J. Brackett is not trademarked, and I have been unable to locate their head office. My assumption is that they are based in the United States and import their watches from China. 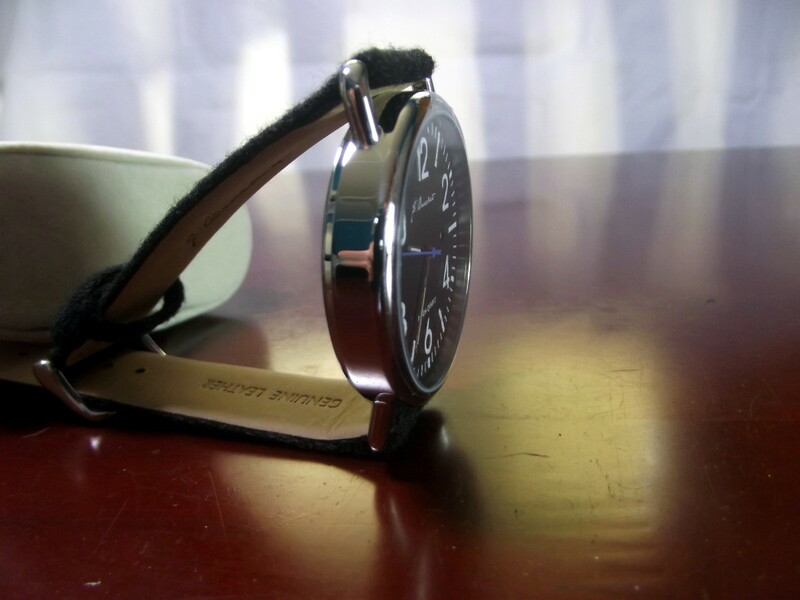 J. Brackett timepieces can be purchased online at their website. They are also available at other sites such as ebay. The price of a Camden quartz varies between $50 and $140. 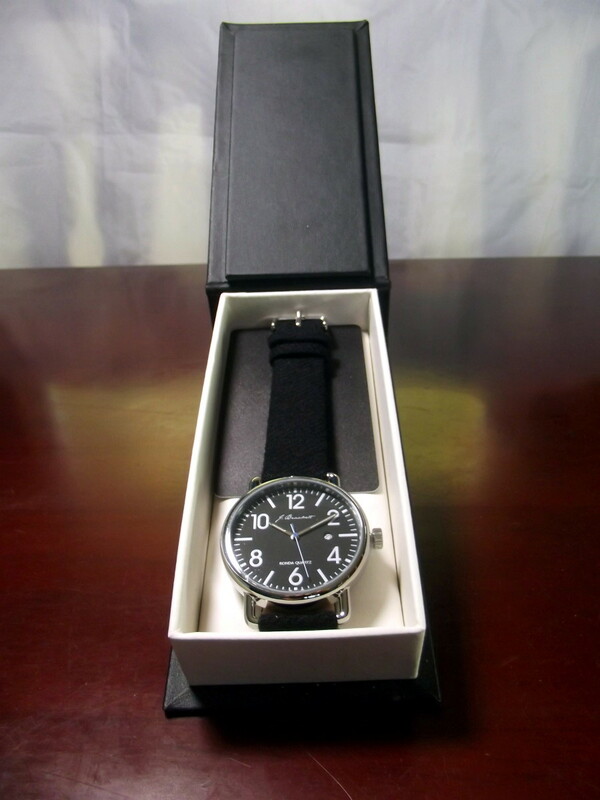 This watch features a black dial with large, easy to read hour indications. 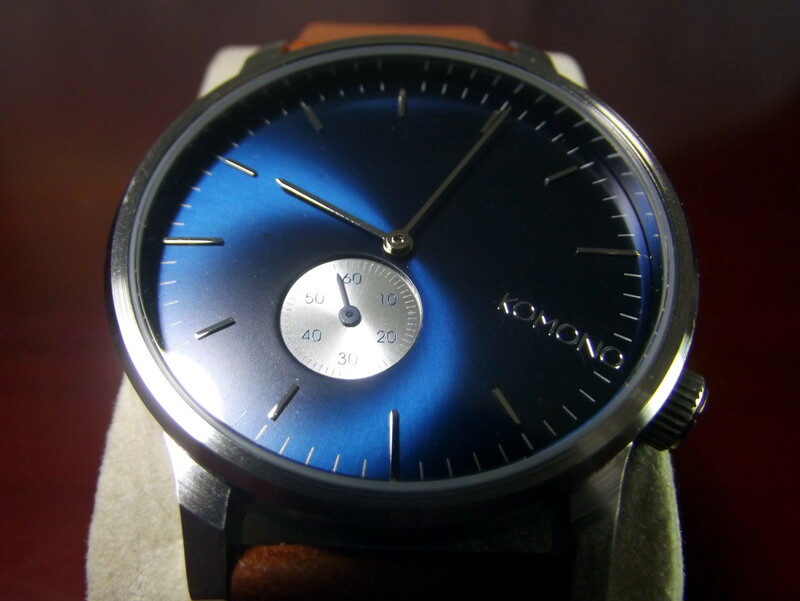 This contrasts well against the shiny stainless-steel case. I particularly like the faux wire lugs and their suggestion of antiquity. I’m not so enamored by the leather backed, pressed wool strap. It may be innovative, but I suspect this band will attract dirt and prove difficult to clean. 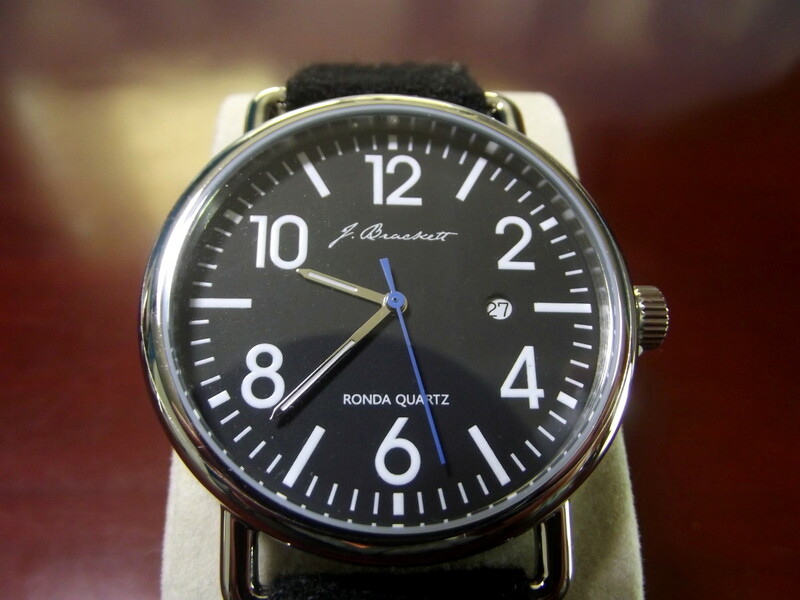 The J. Brackett Camden is powered by a genuine Ronda 505 quartz movement. While it is not a Swiss timepiece, the Camden is as close as you’re going to get within this price range. A 316L stainless-steel case in conjunction with a scratch resistant, mineral glass crystal protects the inner workings of this watch. 316L stainless-steel is highly corrosion resistant. 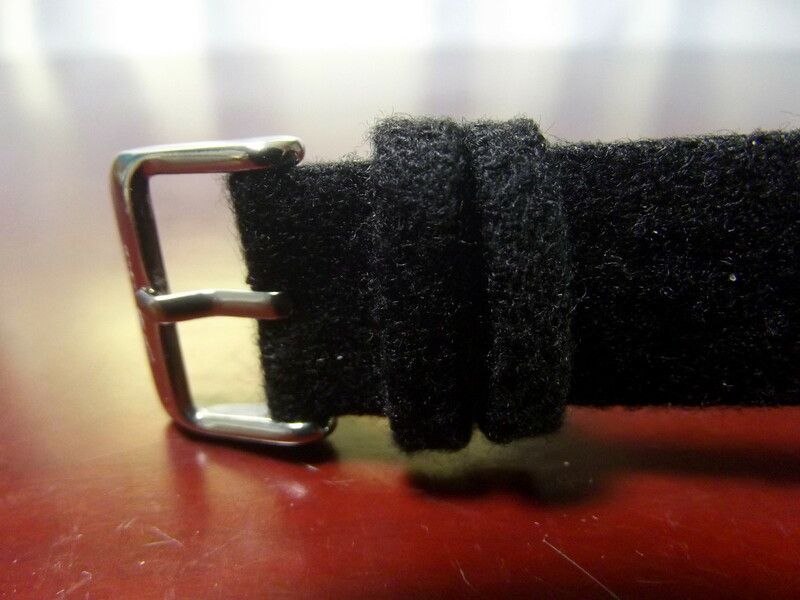 The accompanying strap is fabricated from leather backed, pressed wool. It appears quite sturdy but, since I have not encountered this type of band before, I cannot comment on its longevity. 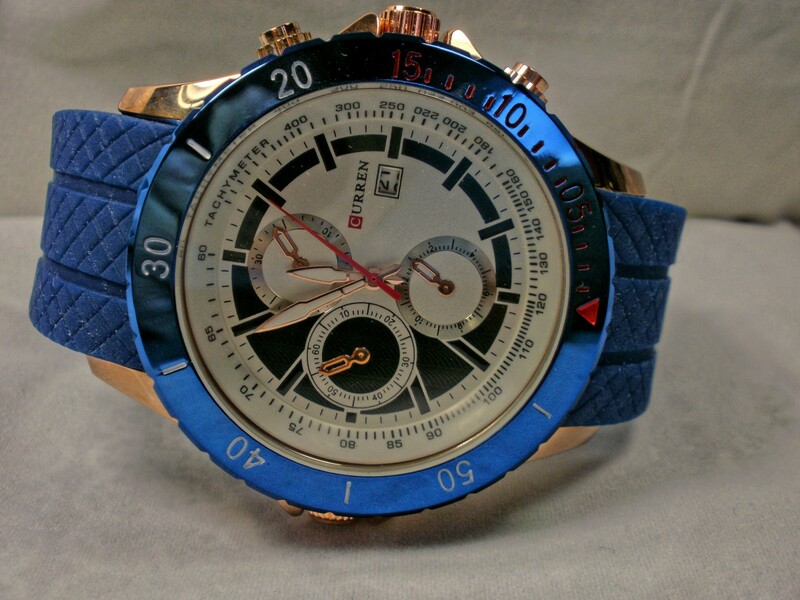 Water resistance of 5ATM ensures this timepiece can be used for swimming. 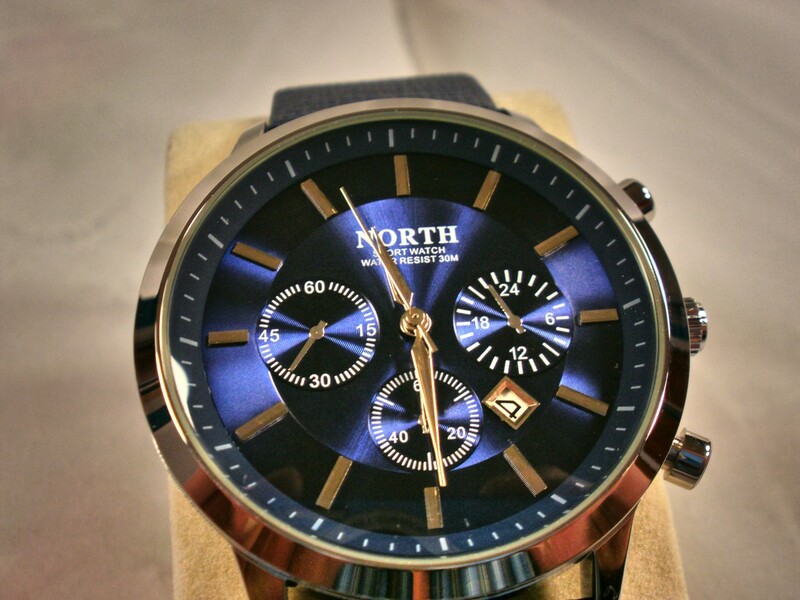 The Camden is a clean looking watch with a name-brand movement and a well-designed case. It should provide years of yeomen service. J. Brackett’s Camden is recommended. The following poll is designed to determine what type of movement is preferred by potential purchasers of a watch. 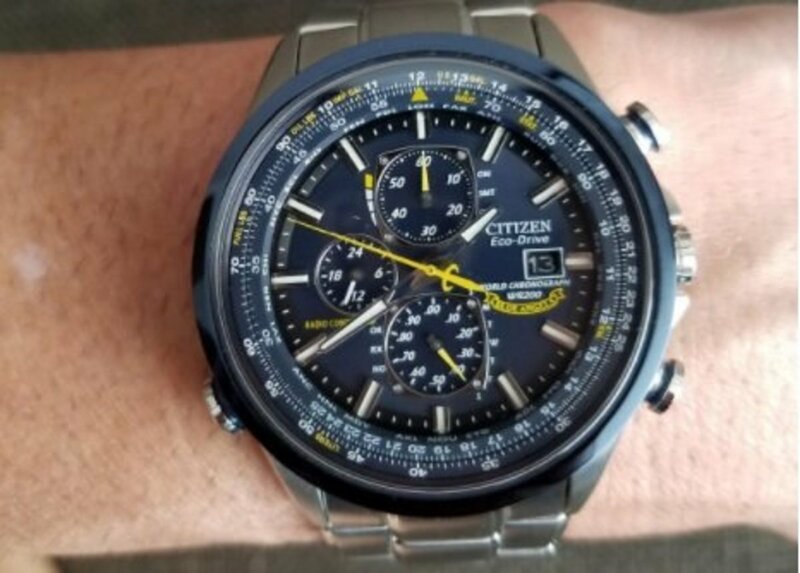 Which of the following movements would most likely convince you to purchase a watch? Price is key. As long as the watch is accurate, I am happy.